Arca Jeth was an Arkanian male who was a Jedi Master and Watchman of the Onderon system during the time of the Old Republic. He was known to have been one of the wisest Jedi of the Old Republic era, and trained Barrison Draay, Haazen, Ulic Qel-Droma, his brother Cay Qel-Droma, and the Twi’lek Tott Doneeta in the ways of the Force. He was also one of the first known Jedi to use the ability of battle meditation. In 4,050 BBY Master Jeth was part of a Jedi/Republic task force which was sent to the Hapes Cluster to eliminate the threat of the Lorell Raiders, who had been preying on Republic shipping lanes for decades. Following the defeat of the Lorell Raiders, Jeth took part in the Hyabb-Twith Campaign and helped drive the Nelori Marauders from the Hyabb-Twith Corridor. He served the Galactic Republic on Coruscant during the Great Droid Revolution of 4,015 BBY in which he demonstrated the Force technique that allowed the Jedi to deactivate the attacking droids using the Force. He would later mediate the Beast Wars on Onderon, and help drive the dark side spirit of Freedon Nadd from the planet. After helping Onderon to obtain peace, Arca was slain at the Conclave on Deneba by a Krath war droid. In the arms of his most gifted student, Ulic Qel-Droma, Arca Jeth became one with the Force. Interestingly, Arca’s surname was never mentioned in the Tales of the Jedi comic-book series, and was only provided the last name of Jeth with the release of the Tales of the Jedi Companion from West End Games. On page nineteen of the Tales of the Jedi Companion it is stated that “two dozen Jedi warriors” were initially dispatched to deal with the Nelori threat. However, at the end of the same paragraph it is written that “Only five of the twelve Jedi survived the encounter”. It should have stated that only five of the original twenty-four Jedi managed to survive. In the comic issue Star Wars Knights of the Old Republic 33: Vindication, Part 2 Arca Jeth’s first name is incorrectly spelled as “Arka” in one caption. John Jackson Miller, writer of the Knights of the Old Republic comic series, has confirmed that the this misspelling will be corrected in trade paperback collection which will contain issue 33. One of the earliest known missions of Arca Jeth’s involved the Lorell Raiders who were a group of pirates that colonized the Hapes Cluster some time before 4,000 BBY The Raiders eventually learned a number of safe routes through the Transitory Mists from which they could attack Republic shipping lanes, and in which they could also hide during lulls in their pirate raids. In the year 4,050 BBY a large number of the raiders were killed when they were caught outside of the Mists by a Republic task force led by Arca. The losses inflicted on the Lorell Raiders by Arca Jeth and the Republic forces spelled their end; the women of the Hapes Cluster, who were now freed from the servitude of the Raiders, instituted a female dominated society and placed all power in a single monarch, the Queen Mother. Arca Jeth first earned his reputation as an expert lightsaber master during the Hyabb-Twith Campaign, which constituted a series of skirmishes between the Jedi Knights and the Nelori Marauders of the planet Dachat. The confrontations took place along a disputed hyperspace route known as the Hyabb-Twith Corridor, which was an area that had seen constant conflict for centuries. With the Nelori Marauders striking from their base in the safety of the Hyabb-Twith Corridor, Republic shipping lanes in that area were no longer safe. The Marauders grew bolder with every successful attack, and began striking Republic member worlds deeper and deeper into the Core. Jeth, along with a number of other Jedi, began to take notice of the Nelori Marauders’ aggressive activities, and as the number of dead Republic citizens began to climb, the Jedi called a meeting at the library world of Ossus. The Jedi decided that it was time to stop the aggression of the Marauders, and thus dispatched a task force to deal with the problem. Immediately, two-dozen Jedi were sent from Ossus and they managed to encounter, and pursue, several Nelori starships back through the Hyabb-Twith Corridor. The Jedi tracked the Nelori back to their main base on the planet Voon, and coordinated an attack on the headquarters. The Jedi managed to severely damage a large majority of the Marauders base, and kill most of the Marauders stationed there. However, the besieged Nelori managed to send out a distress call to other Marauder bases in the vicinity, and before long reinforcements arrived and launched a vicious counter-assault against the Jedi. Of the original twenty-four Jedi dispatched to the Hyabb-Twith Corridor, only five managed to survive the counter-attack and call for their own reinforcements. Within the next forty-eight hours a further thirty Jedi, including Arca Jeth, arrived in the Hyabb-Twith Corridor to join the remaining Jedi already there. Since the initial attack, the Marauders had gathered their remaining forces from throughout the Corridor and established a stronghold on Voon. Together, the Jedi launched an all-out attack against the gathered might of the Nelori Marauders. However, upon arriving at the Nelori stronghold the Jedi stormed in and began searching—only to find it deserted. There were no Marauders, no shared living spaces, no half-eaten plates of food—nothing. The Jedi wondered among themselves where the enemy was and how they could have escaped the planet without the Jedi knowing. At that moment, however, Arca Jeth gained a moment of insight into the situation. He stretched out his Force awareness and felt below the Nelori stronghold, deep into the subterranean caverns that pocketed Voon’s crust. There, Arca felt—something—a mass of life that was so tangled and entwined that he realized that he had never felt anything like it in the Force before. Arca warned his fellow Jedi and together they cautiously began moving downward, below Voon’s surface. The Jedi followed Arca down through the stronghold and into its lower-levels, eventually coming to a crudely cut, sloped corridor which led to a cavernous antechamber. Arca led the other Jedi warily down through the passageway and into the awaiting chamber. Once there, Arca again reached out with the Force and sensed a dark coldness permeating the Jedi’s surroundings. Suddenly, the antechamber exploded into a hailstorm of blaster fire as more than two hundred Nelori Marauders attacked the enclosed Jedi, killing four immediately. Arca responded instantly and leaped forward to stem the onrush of the Nelori; the other Jedi were not far behind him, and together they formed a defensive perimeter around their fallen comrades. The Nelori Marauders attacked the Jedi perimeter with such ferocity that the Jedi’s numbers slowly dwindled. Meanwhile, Arca began to realize that his own attacks were becoming more and more fierce; he noticed that he was relying on his own emotions instead of the Force to counter the enemies attack. Arca continued to counter the Nelori’s attacks, but he changed his focus, instead concentrating on an image of victory and giving it over to the Force. What followed was an unexpected change of events, with the tide of the battle soon changing; the remaining Jedi felt a strengthening surge, while the Marauders were suddenly in a state of upheaval. The Jedi Knights managed to quickly end the fight and force the remaining Nelori to retreat, thus erasing their threat from the Hyabb-Twith Corridor and ultimately the Core. The year 4,015 BBY witnessed an event on Coruscant that brought Arca Jeth to the forefront of the planets attention: the Great Droid Revolution. he Droid Revolution began with the assassin droid HK-01, which was a prototype for a new Hunter-Killer series of droids planned for production by the Czerka Corporation. For several weeks HK-01 led the droids of Coruscant in a violent uprising against their sentient masters. Ironically, the Republic’s greatest challenge during the revolt was while fighting their own security droids and Juggernaut war droids—a fight which required the Jedi Order’s greatest Masters to destroy the threats. It was during the Jedi’s intervention that Master Arca demonstrated his mastery of the Force technique Droid Disable. With this power, Arca tore through the ranks of the rebelling droids, essentially ending the majority of the droid crisis on Coruscant. The threat eventually came to an end when the Jedi destroyed the leader of the droid rebellion, HK-01. During this time the Masters of the Jedi Order feared the return of the Dark Lords of the Sith, and sent out Jedi to various sites throughout the galaxy that were once focal points for the dark side—Arca Jeth was sent to his homeworld of Arkania, which was once an ancient Sith repository of knowledge. Upon arriving on his homeworld, Arca established a Jedi praxeum in the wilderness, far from the diamond mines that now pocketed the planet. There he trained many apprentices, sometimes up to as many as twenty students at a time. Arca trained his apprentices in the arts of meditating, lightsaber combat against ancient droids, and the lightning strikes of the Arkanian dragon. During this time, Arca and other Jedi Masters gathered within his praxeum to bestow upon two trainees the rank of Jedi Knight: Barrison Draay and Krynda Hulis, daughter of the Jedi Master Noab Hulis. However, during the knighting ceremony Arca was approached by another young trainee whom the gathered masters had decided not to knight. This trainee, known as Haazen, was friends with both Barrison and Krynda and had trained beside them in preparation for one day being promoted. Nevertheless, Arca and the other masters made the decision that Haazen was not yet ready to be a Jedi Knight, and in his anger at what he saw as disrespect towards him, Haazen chose to argue with Arca in front of the other Jedi. Believing that his decision was the right one, Arca steadfastly told Haazen that he had failed as a Jedi. Haazen would eventually allow his anger to lead him to fall to the Dark side of the Force. While his students trained, Arca continued surveying the planet and searching for any presence, no matter how small, of the dark side. In the years prior to the Great Sith War, Arca took three apprentices to train—the brothers Ulic and Cay Qel-Droma, and the Twi’lek Tott Doneeta, all of whom would go on to play key parts in various aspects of galactic matters. In the years following the Great Droid Revolution, Arca Jeth continued to serve the Jedi Order and the Republic. He was eventually charged with the responsibility of being the Watchman of the Onderon system, a system which had recently joined the Republic. Onderon’s populace was divided into two separate and very distinct societies: the monarchy of Queen Amanoa was situated within the fortress city of Iziz; and outside of the city were the outcasts of Iziz, known as the Beast Riders, who had learned to survive in the wilderness of Onderon. Now that Onderon was a member state of the Republic, it was up to the Jedi, and more specifically Master Arca Jeth, to help settle the ongoing dispute which had lasted for centuries. 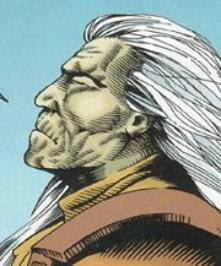 However, after Arca had explained the history of the conflict on Onderon to his three apprentices (Ulic and Cay Qel-Droma, and Tott Doneeta), he told them that he was not going to Onderon to oversee the dispute. Instead, he was sending the three of them to help end the ongoing conflict between the two societies. The three apprentices arrived at the walled city of Iziz, and quickly found themselves embroiled in the conflict between the forces of Queen Amanoa and the Beast Riders. The situation on Onderon soon deteriorated under the guidance of Ulic Qel-Droma, with the conflict growing into a full-scale war. Arca Jeth, upholding his responsibilities as Watchman, arrived on Onderon in his personal ship, the SunGem. Once there he used his battle meditation to influence the tide of the battle, effectively ending the conflict once and for all. Arca managed to unravel the mystery of Onderon’s troubles; the spirit of Freedon Nadd, a long-dead Dark Lord of the Sith, was discovered to have been controlling Queen Amanoa as well as her ancestors for hundreds of years. The sarcophagus of Freedon Nadd was buried underneath the royal palace of Iziz, and it was there that Arca faced the Sith Lord’s spirit and forced it to abandon its hold over Amanoa, thus breaking Nadd’s control over Onderon’s rulers. Even though Arca had managed to break Freedon Nadd’s hold over Queen Amanoa, Nadd’s remains were still causing a dark shadow to imbue the city. To quell this feeling, Arca and his apprentices planned to transport the sarcophagus of the Sith Lord away from Onderon to its primary moon Dxun, where an enormous tomb would hold the remains. 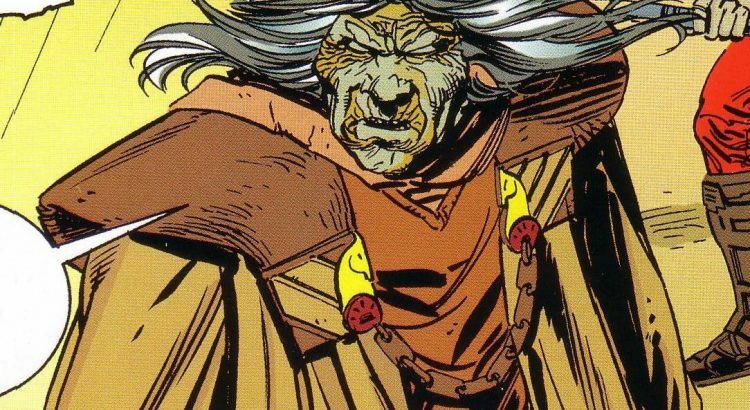 During a procession for the remains of Nadd and Amanoa, a dark side apprentice by the name of Warb Null led a Naddist attack against Jeth and the other Jedi. While Cay Qel-Droma and Oss Wilum defended against Null, Arca was suddenly attacked by an invisible dark force, which effectively neutralized him. With Warb Null fighting the Jedi, the Naddists managed to steal the sarcophagi of Freedon Nadd and Queen Amanoa, and then retreated back to their underground dwellings. 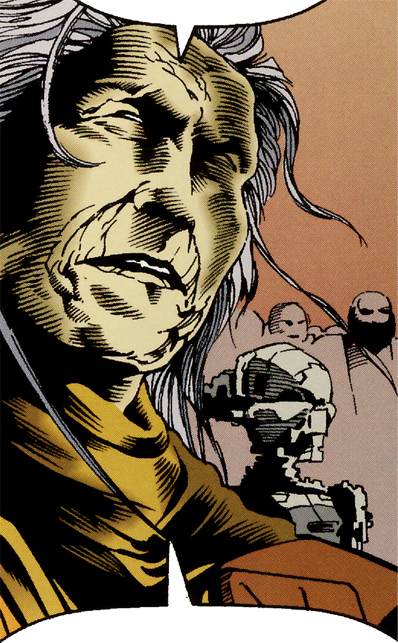 After Warb Null had retreated from the skirmish, Ulic and the other Jedi rushed to Arca Jeth`s aid. The attack, mixed with the dark side strike, proved what Jeth had thought all along; that Sith magic was still active on Onderon. Upon hearing this, Queen Galia told Master Arca about her father, King Ommin, who she said knew of the dark side even more then her late mother, Amanoa, had. Galia led Arca and Ulic Qel-Droma to where her father, a seemingly decrepit and sick old man, was being cared for. However, when they arrived, Ommin let it be known that he was not as helpless as he seemed; while the spirit of Freedon Nadd appeared, Ommin lashed out at Master Arca and disabled him with a surge of dark side energy. Galia, who was surprised and horrified at her father’s transformation, stayed with Ulic while he tried to fight his way through Ommin’s guards to rescue his fallen master. However, Warb Null appeared and managed to hold Ulic at bay while Ommin escaped with the unconscious body of Arca Jeth. Ulic managed to defeat Null, killing him the process, but was unable to reach Arca in time to rescue him. With the capture of Arca Jeth, Ommin planned to torture Arca to the brink of death, where Ommin believed that Arca would be forced to call upon the dark side of the Force to save himself. At that point, Ommin planned to destroy Master Arca’s body and thus raise the fallen Jedi as a dark side spirit. To this end, Freedon Nadd assisted Ommin in his torture of Arca Jeth. Meanwhile, Ulic sent a request to Ossus for further Jedi support in helping to rescue Master Arca and to defeat Ommin. A strike team was sent which included Nomi Sunrider, Dace Diath, Shoaneb Culu, Kith Kark, and Qrrrl Toq. 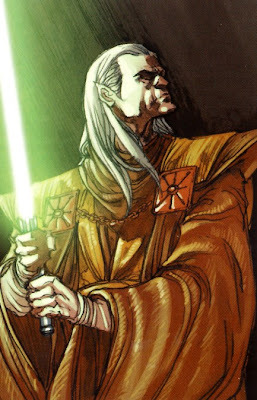 The Jedi reinforcements arrived on Onderon and immediately fought their way to where Ulic and his remaining Jedi were. Together, they stormed the stronghold where Arca Jeth was being held and managed to fight through Ommin’s guards. The combined might of the Jedi forced Freedon Nadd to withdraw his spirit’s support from Ommin, and thus Ulic was able to charge forward and kill the old man and rescue Arca. Following the defeat of King Ommin, Arca Jeth supervised the internment of Freedon Nadd’s remains in a tomb on Dxun. Following the Freedon Nadd Uprising, a pair of aristocrats from the Empress Teta system seized power in a bloody coup and named themselves the Krath, after a fearsome childhood legend. These two usurpers were Satal Keto and his cousin Aleema, and both were proficient in the use of Sith sorcery taught to them by the late King Ommin of Onderon. Due to his firsthand experiences fighting the Sith, Master Arca was the Jedi Order’s choice to lead an attack against the Krath. Having received his assignment, Arca traveled back to Onderon to inform Ulic and the other Jedi of the new developments. After dispatching the young Jedi on several different tasks, Master Arca traveled back to Deneba to address the Jedi assembly there. 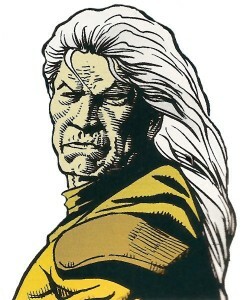 During the assembly, Ulic proposed his plan to defeat the Krath by infiltrating their society and operating from within. Arca, along with the unanimous support of the gathered Jedi, strongly opposed the plan and the dangers that it posed. However, before he could speak, the Krath launched an army of war droids against the assembly. The Jedi fought bravely, pushing back the droids, and Master Arca once again demonstrated his mastery of Droid Disable against the invading horde. 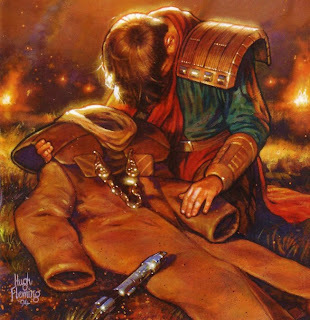 The Jedi defended each other furiously, but the battle had a tragic end—Master Arca was struck down by a Krath war droid even as he saved Ulic Qel-Droma‘s life and died in the arms of his student. Following Master Arca’s death on Deneba, Ulic Qel-Droma was overcome with grief and blamed himself for the death of his master. As a result, Ulic went ahead with his plan to infiltrate the Krath believing that his desire to avenge Arca’s death justified the action—Ulic would eventually fulfill his destiny of becoming a Dark Lord of the Sith. 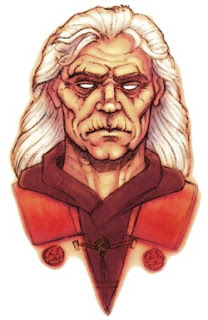 Following the Great Sith War, Ulic Qel-Droma was defeated and stripped of his ability to use the Force: Ulic had led a titanic war against the Republic; become a Dark Lord of the Sith; and eventually killed his own brother, Cay Qel-Droma. These incidents, combined with Nomi Sunrider’s stripping him of the Force, led Ulic into a self-imposed exile on the tundra planet of Rhen Var. While there, Ulic entered a state of depression where he constantly reflected on the life he lived, the love he lost, and the mistakes he had made. It was during one of these moments of reflection that he began to contemplate his own death and he wandered out into the snowy wastes of Rhen Var. It was then that he experienced a vision of his long-dead master, Arca Jeth. Ulic argued with Arca about what he had left to live for since he could no longer feel the Force. Arca, after asking if Ulic was a coward, reminded Ulic that he was still in possession of what he had always had—his inner strength, and natural lightsaber skill. Upon hearing this Ulic reflected on the fact that he owed Master Arca so much, and for that Ulic vowed he would live. Unfortunately, another of Arca’s apprentices, the un-knighted Padawan Haazen, would also take the dark path just as Ulic Qel-Droma had done. Using a secret Jedi Covenant to create a rift in the Jedi Order, Haazen would amass a trove of deadly Sith artifacts in a plot to elevate his own power over not only the Jedi, but the Republic as well. At some point in his career as a Jedi, Arca Jeth created his own holocron which eventually became buried on Arkania. It would later be rediscovered and given to the Jedi Master Tionne on behalf of the New Jedi Order.